Common Nighthawks coexist with a number of other species on rooftops, including these species caught on my motion-activated nest cameras. I’ve also observed Rock Pigeons and American Kestrels nesting in the drain pipes on these rooftops and the occasional passing Eastern Fox Squirrel. One of the greatest challenges that nighthawks face is the predation of eggs and chicks by American Crows. Fortunately, this eastern South Dakota population has a small population of crows. But, where there is an empty niche, another species will sometimes fill it. So, not surprisingly, often grackles will harass nighthawk nests. It’s rare that eggs and chicks will disappear, presumably due to predation, at these nest sites. I believe these grackles are territorial and just want nighthawks to leave. Here a Common Grackle squawks at a nesting nighthawk female. This nighthawk abandoned her eggs after this interaction. What is surprising is that sometimes Mourning Doves harass nighthawks off their nest. This nighthawk later abandoned her chicks. The Mourning Doves harassed her and the male for days. When I checked the nest a couple days later, there was a mob of doves at the nest site with no sign of the chicks or adult nighthawks. Congratulations to the University of South Dakota Sustainability Program and the Missouri River Institute. As part of a joint venture to study food security and the bioenergy industry in the Upper Missouri River Basin, the two organizations have teamed up and will receive a National Science Foundation grant to study these topics locally as part of a larger study. In addition, the program will fund a new Sustainability PhD program at USD and two new faculty positions. For more information about their new efforts, check out this USD press release and the USD Sustainability Program site. Birds can respond to storms in a couple ways, hunker down or get out of the way. Countless observations (including this recent Golden Winged Warbler observation) have shown that animals can sense that a storm is coming and avoid it before it arrives. However, some storms storms are impossible to evade. August and September is peak hurricane season in the Atlantic, and Hurricane Hermine is making news. Reportedly, migrating birds are being trapped in the storm’s eye which is exciting birders who might benefit by viewing rare birds reaching their shores. But, what about the deleterious effects? This Audubon blog post has a great summary on how birds can survive hurricanes. Since hurricane season and early migration coincide, does this have long-term effects on bird populations that migrate early? Will climate change have an effect on migration phenology or timing of peak hurricane season (by extending the warm period for the Atlantic Ocean)? Too many questions. Not enough data. The short legs of a Common Nighthawk chick. The pectinate claw has yet to develop on the middle and longest toe. Some birds have a comb-like structure on one toe for grooming. 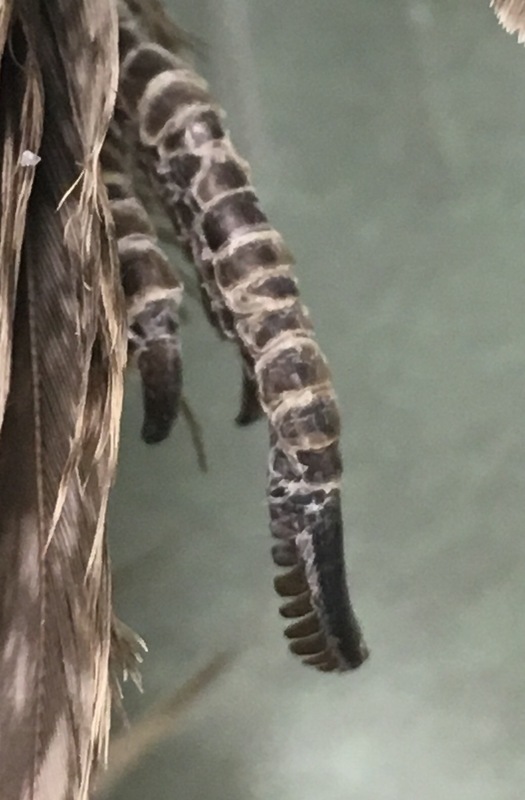 Dan Tallman wrote an excellent post on the difference between the Common Nighthawk and Heron’s pectinate claws. Nighthawk researchers have wondered whether this was a vestigial structure, an ancestral appendage that is no longer useful. This is because nighthawks have short, stumpy legs. They are clumsy walkers and are unable to perch in trees and instead lay on and parallel to limbs when roosting in trees. So, are nighthawk pectinate claws useful when presumably they cannot reach their short legs to their plumage? Presume no more! They can and do reach their head with their feet while grooming. Having a hard time seeing the foot? Here it is.